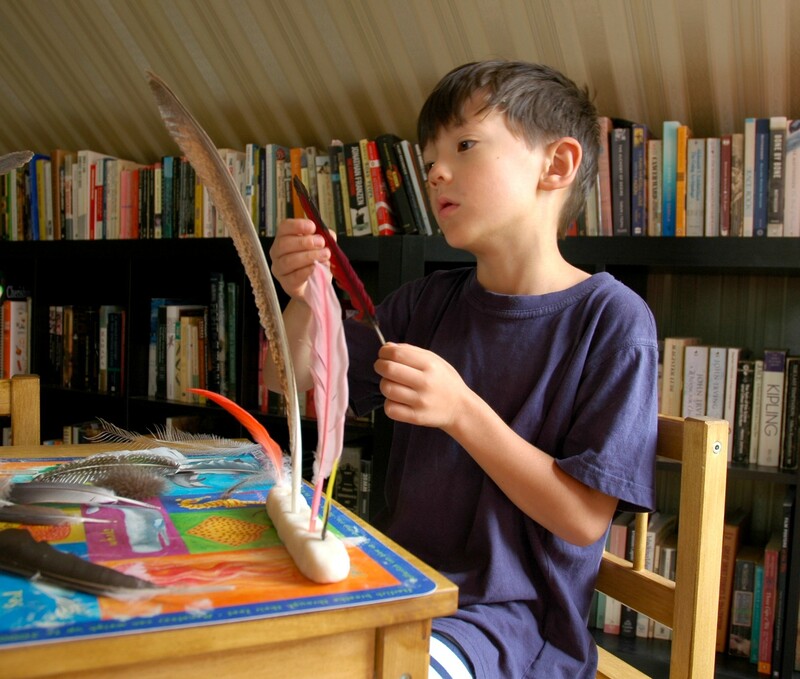 Kids are incorrigible collectors. 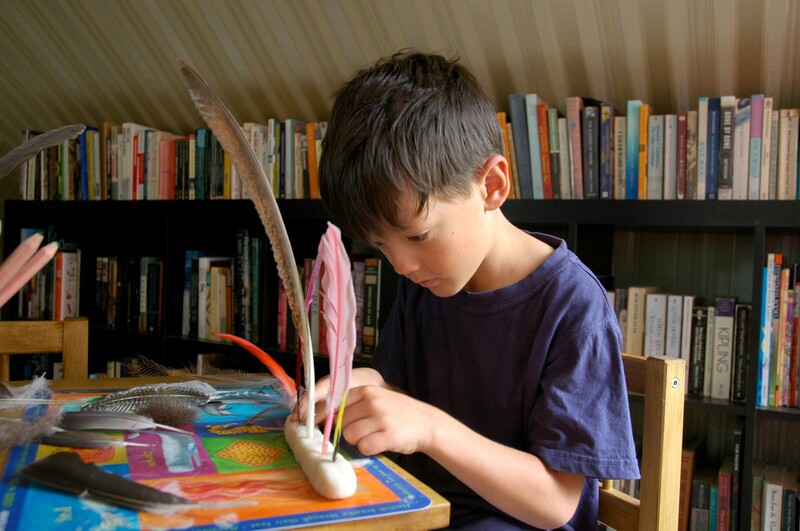 On the desks and window sills of our sons’ room, there are, among other things, the jawbones of a deer and a wild pig, multiple wasps’ nests, the tiny fur-lined cup of a bird’s nest, piles of dead and dessicated insects, the skull of a hedgehog (some skin, sinew and quills still gruesomely intact), various interestingly-shaped sticks, seed pods, and stones, a jar of sea glass, and feathers, lots of feathers. All of this hodgepodge is great, but the problem becomes where to put it, how to display this debris to best advantage. 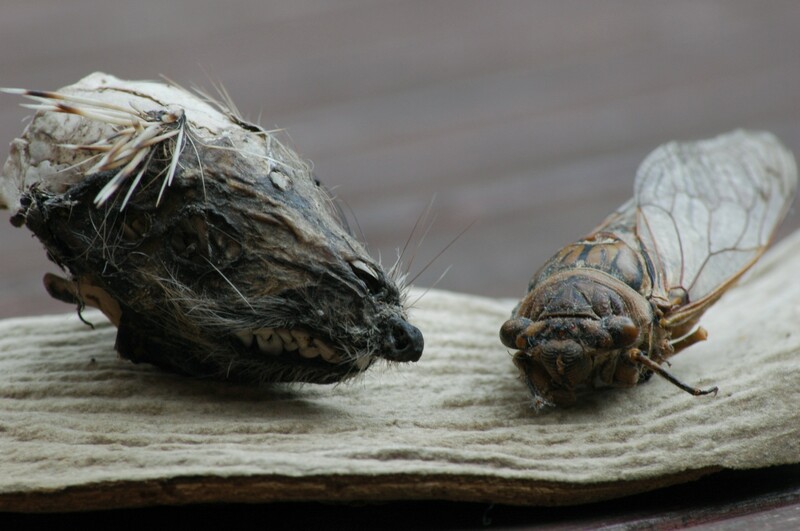 Martha Stewart is strangely silent on the matter of artfully arranging moth carcasses. We’ve come up with two ways to make these treasures look more like found art and less like the litter left by a tornado hitting a natural history museum. 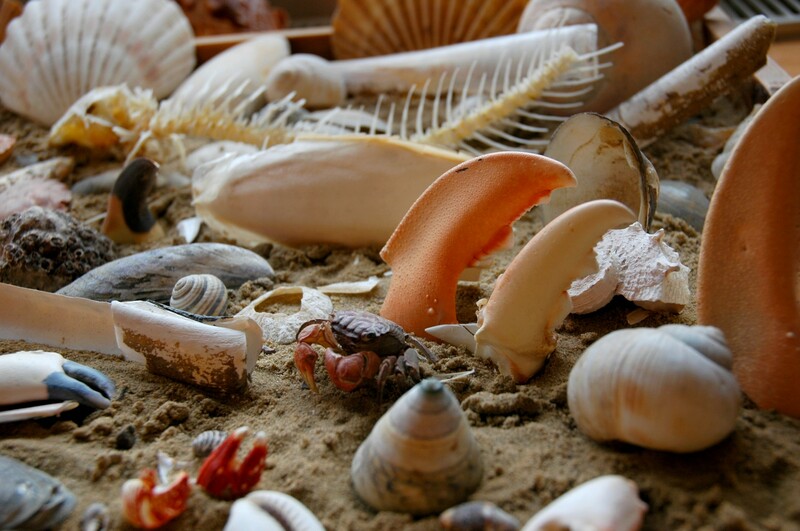 The first involves beach combing finds – shells and sun-bleached bones and crab carapaces and such. 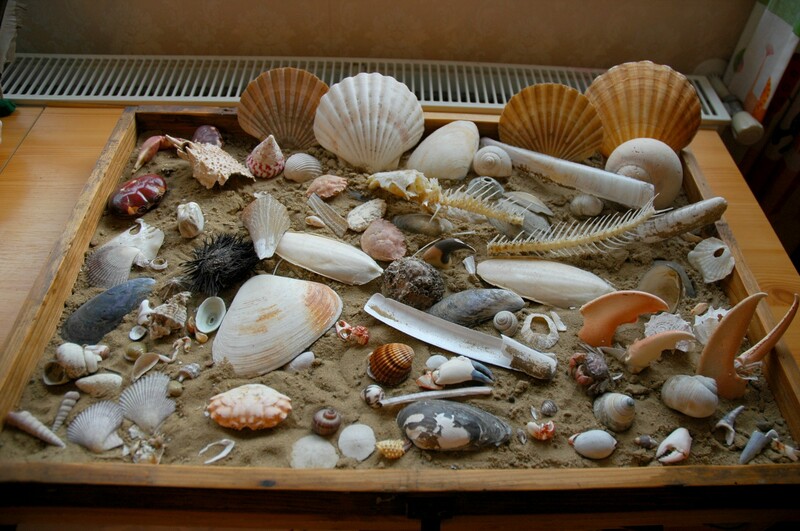 Take your tray (I removed the lid on the box and used that), fill it with an inch or two of sand, and then let your kids arrange their beach finds as they see fit. 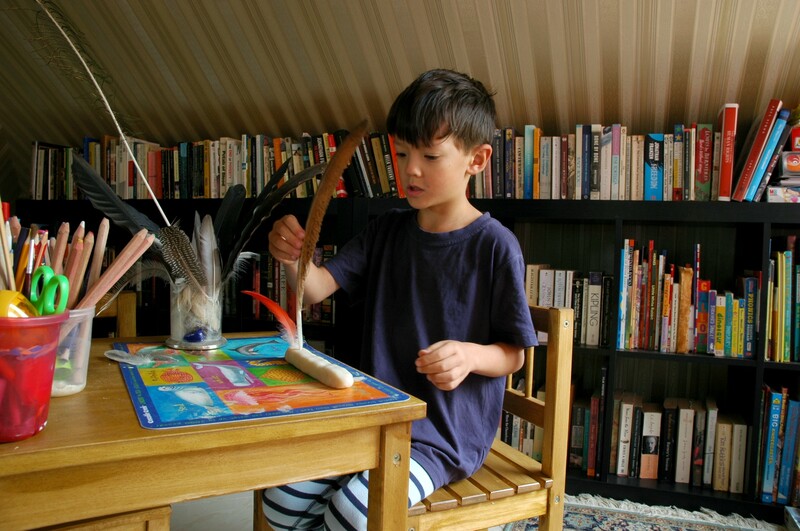 The cool thing is that they can rearrange items as the mood hits them or when they find more treasures. It looks great, forces them to sift through their things, choosing only the best, and limits the sheer spatial spread of their stuff. 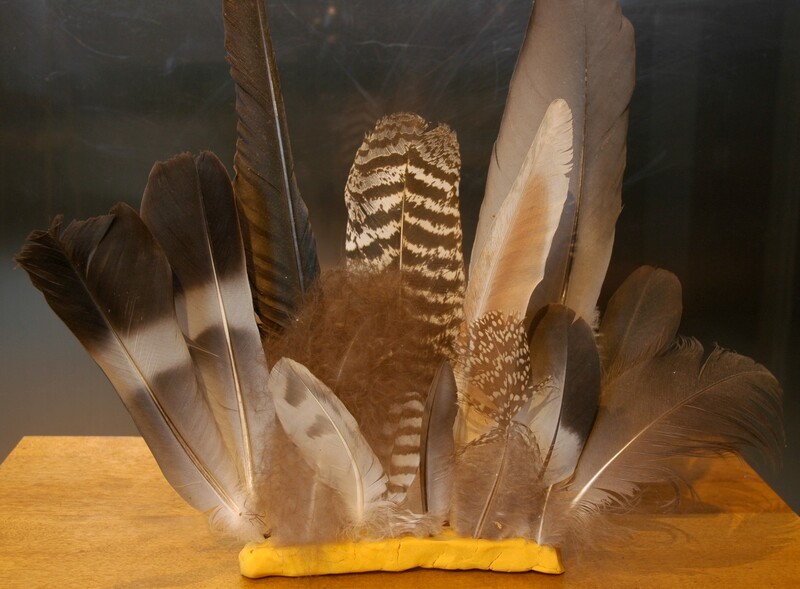 The second project involves finding an attractive way to display feathers. That’s it. Take your dough – this time we used some of our own homemade – and roll it out into a fat sausage. Flatten the sides until you have a roughly elongated rectangle. 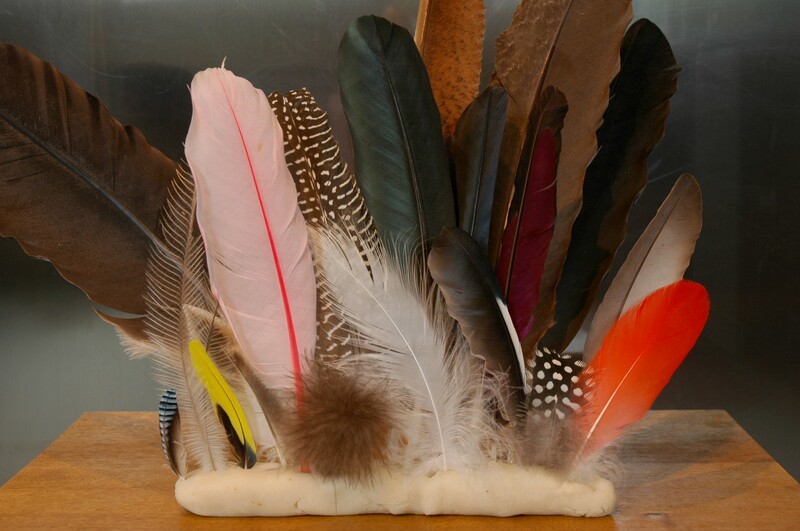 Select your feathers, and stick them into the dough. 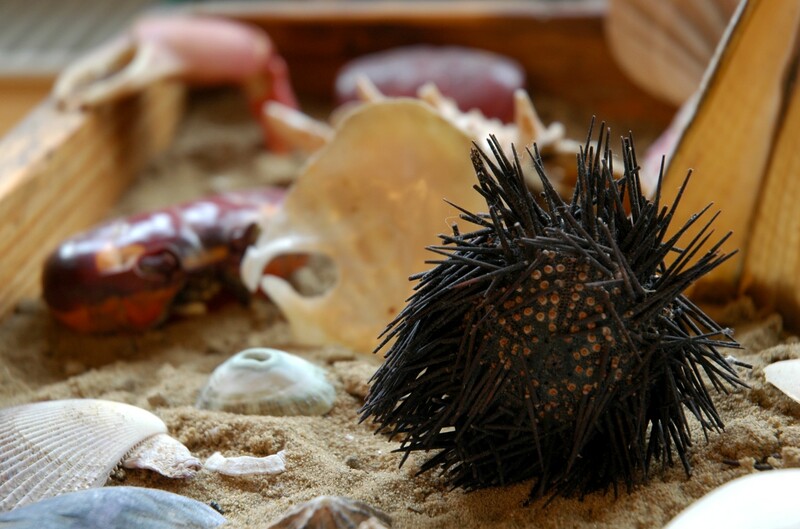 Place the arrangement in a protected spot and let it dry, a process which will take a week or so. 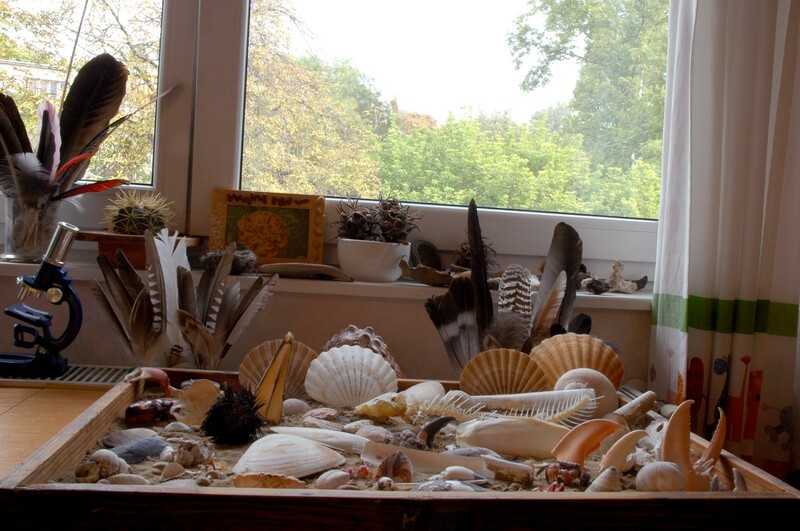 When dry, the feathers are securely cemented into your matrix and you have a portable, permanent display. 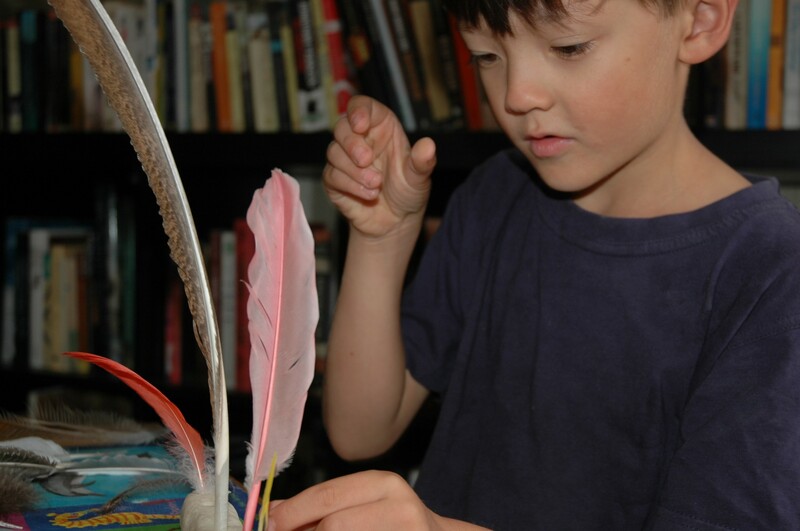 The feathers for the particular arrangement my son made today came from both our hiking trips and visits to the zoo. Birds represented here include: greenfinch, jay, flamingo, scarlet ibis, black vulture, guinea fowl, glossy ibis, and cassowary. Can you identify them? Well thanks! I hope to have good stuff to keep you coming back for more. Greetings! I’ve been following your weblog for a long time now and finally got the bravery to go ahead and give you a shout out from Porter Tx! Just wanted to say keep up the excellent job! You’re welcome! It really works well, and they look great. Cheers! Neat stuff! Thanks for sharing the ideas, especially since our three-year-old daughter is now bringing home leaves and twigs, etc., after we head out to parks and such. Perhaps the Play-Doh option will work! Thanks for also reading Synchronized. These are great ideas. 🙂 Cool post. Thanks, livesinstone. I love doing this kind of stuff with the kids. The feathers look great. Is it too much to expect the kids to respond to a “Let’s make a cemetery with real flowers and have a real burial for the dead animals” suggestion? There comes a time…And it can be quite soon if they’re smelly. Actually, just a few days ago, I threw out some disintegrating insects from my own collection. If half the centipede is powder, it’s time to let it go. We have a female stag beetle in a similar state of disintegration, but are still holding onto it. Or what is left of it. Great ideas I might try something of that nature for the beach stuff as my youngest is always collecting things from the beach. When we do beach trips we always come back with buttloads of stuff, so we had to find a way to keep it under control. This seems to work pretty well. I love curbside pickup days, and there’s an interesting custom here in Budapest. People go very early and stake out a particular pile, laying claim to all the best stuff. You can then buy these things from the ‘owners,’ generally for a very small fee. To give you an example, I picked up a bench toy chest for about $5 from the guy who had laid claim to it, cleared the gunk out of it and gave it a new coat of paint, and it sits in my boys’ room. I just wish I had a workshop so I could take more stuff and do crafty things with it. Some great ideas can’t wait to try them out. Thanks for posting.